It’s my day to post inspiration over at Get Inky Stamps by Blue Moon Creations. Their challenge right now is 3-D holiday. I really have found being on a design team keep me motivated since the topics aren’t always what I’d do or it makes me really think how to use their stamps/ideas to bring you a great idea. 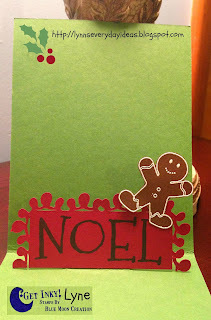 I love making holiday cards, and I can’t tell you how pleased I am with how this one came out. I used my elegant edges cricut cartridge and cut out the red background. I think it’s just supposed to be decorative, but the border really reminded me of the old gigantic Christmas light bulbs! The green is then embossed with the Cuttlebug. The red is popped with 3-D foam dots and the green is adhered to that. 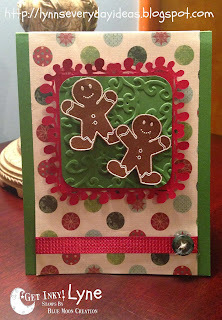 I used the Get Inky 2013 Holiday set and embossed the gingerbread men and fussy cut them. They are then popped up as well. Inside is a pop-up card with another gingerbread man popped off of there. Can we say popped one more time!? I hope this gives you a holiday idea and that you join us for the challenge. 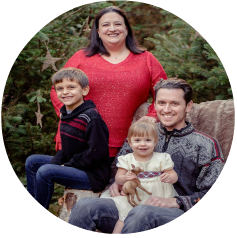 Are you making your holiday cards this year or purchasing? This is a lovely card Lyne!! I am making my holiday cards this year. I am not sure how many yet. I still have to design it. I always send a picture so I am not sure if I want to enclose the picture or incorporate it in the card front. Thank you La-Vie. I usually make my cards as well…at least for close friends and family that is.